This newly opened, all-inclusive resort island can only be reached by a private seaplane or helicopter from Nami International Airport. Spread across 140 acres of lush tropical flora and powder-white sand are 21 beachfront villas, dotted sparingly along the islands two longest beaches. The villas, which range from one to three bedrooms, offer absolute privacy. With the Great Astrolabe Reef on your doorstep, Kokomo provides guests with 45 unique diving sites. Venture a quick 10 minutes offshore by boat and you can find yourself swimming alongside manta rays and dolphins. You will also have access to some of the best game and sport fishing all-year-round. Aside from a variety of water activities, guests can also try their hand at Sulu (sarong) styling, learning Fijian language and cultural weaving, carving and story-telling. Organic fruits and vegetables are planted, raised and prepared on the island. With its colonial-inspired interiors and antique furnishings, the Royal Malewane invites guests to step back in time. Open since 1999 but having just completed a major refurbishment this month, this property shares an unfenced border with one of Africa’s most famous national parks: The Kruger National Park. Its largest exclusive-use bush villa is The Africa House which has six bedrooms, each with its own private outside shower and deck. Expect to spend your days going on secluded bush walks, private game drives and safaris to spot lions, leopards, African bush elephants, rhinoceros and African buffalos. You can also wind down at the resort's award-winning spa, set in the middle of the African bush. If you love Africa but would rather skip the safari, check out Miavana. Located on the private island of Nosy Ankao off the coast of Madagascar, the resort is nestled within the Loky Manambato Protected Area marine park, so guests can go whale-watching, discover beautiful coral reefs by snorkelling in the pristine waters, and even encounter lemurs and turtles while walking along the beach. Two helicopters are available to transport guests to neighbouring islands for more exploring. For those looking for rest and relaxation, 14 one-, two- and three-bedroom villas facing the sea are kitted out with a private pool, kitchen and butler. You can also request to sleep under the stars if you so desire. A strong awareness for the environment runs through the property, with the villas being constructed from local Malagasy stone and recycled materials, and powered by solar panels perched on the roof. Re-opening in July after a US$60-million renovation, The Datai will be introducing the five-bedroom The Datai Estate, which, at 3,500sqm, is one of the largest villas of its kind in Asia. The estate comprises spacious living rooms, game rooms, a private sundeck, garden and 15-metre pool. The estate offers an unobtrusively intimate experience with the lush jungle while offering sweeping views of the turquoise Andaman Sea. Impeccable private butler service, a private chef and complimentary afternoon tea are all part of the experience. From its remarkable location in the ancient rainforests of Langkawi Island, The Datai Langkawi pays homage to nature and preservation. For a truly unique vacation filled with discovery, explore the preserved coral reefs and look out for humpback dolphins, who frequently visit Datai Bay in search of food. This property in Belize touts itself as the world's most private island resort, and for good reason. The Gladden Private Island only allows two to four guests at a time, and while you're ensconced in the island's 3,000-square-foot villa, you’ll never spot a neighbour. This island jewel is set in a swirl of turquoise and aquamarine lagoons fringed with coral and white sand in the heart of the Belize Barrier Reef Reserve System. There is a second master suite, but it is only to share with friends or family. Practically the whole island is yours to explore and enjoy, since the resort staff reside on the smaller island behind Gladden, far enough to maintain privacy but close enough to respond to any request at a moment’s notice. This ultra-exclusive pocket of paradise has been around for a while, but recently scooped up the ‘Best for Aquatic Species & Habitat Conservation’ award by the African Responsible Tourism Awards. A favourite of royals, celebrities and the elite, this super-secluded, private island sanctuary can only be reached by helicopter. 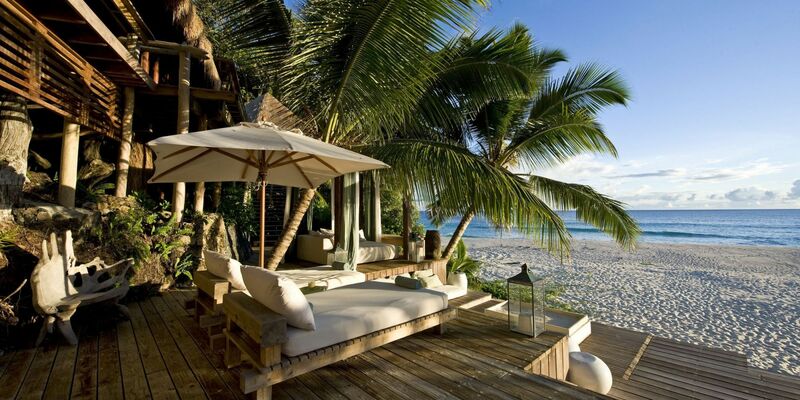 It boasts four white sand beaches surrounded by coconut palms and takamaka trees for utmost privacy. The luxurious eco-friendly villas include a separate living room, indoor and outdoor showers and a plunge pool. You’ll also be assigned your own butler who can arrange activities and make sure that you and your loved ones are expertly looked after. Eating here feels special every time, as each meal is tailored to your taste buds and food requirements. A verdant forest, crystal-clear waters and a private stretch of powder-soft white sand makes this luxurious all-inclusive resort in Siargao, Philippines an amazing tropical getaway. Nay Palad Hideaway, formerly Dedon Island, just re-opened, offering a private retreat of just 12 villas, where guests can live out their tropical fantasies at the edge of the Pacific Ocean. Everything here, from the sea-fresh cuisine to indulgent massages and island excursions, is included in your stay. If complete privacy is what you're after, a sprawling Master Villa comes with its own swimming pool, rooftop nest and secluded beach.